A popular perception is that landfalling tropical cyclones help to mitigate droughts in the Southeastern United States (SeUS). However intriguing paradigms on the role of large scale SST variations on continental US including SeUS droughts and seasonal Atlantic tropical cyclone activity confronts us. These paradigms suggest that in the presence of warm (cold) eastern tropical Pacific and cold (warm) Atlantic Ocean sea surface temperature anomaly (SSTA) lead to the increased likelihood of wetter (drier) conditions over the continental US including the SeUS. Juxtaposing this understanding with the fact that landfalling tropical cyclones contribute significantly to the annual mean total rainfall in the SeUS and in El Niño (La Niña) years with cold (warm) tropical Atlantic SSTA lead to reduced (increased) Atlantic tropical cyclone activity raises a conflict on the role of the large-scale SST variations in SeUS hydroclimate. 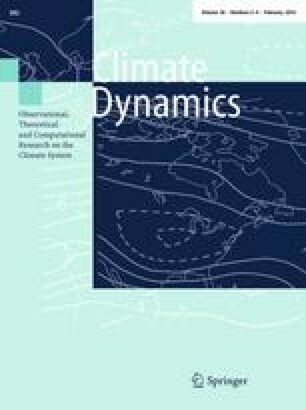 This study attempts to investigate the apparent dichotomous role of the large scale SST variations on the SeUS hydrology by examining the role of rainfall from landfalling tropical cyclones in the SeUS to local seasonal droughts. Our study finds that the contribution of the rainfall from landfalling tropical cyclone on the mitigation of monthly drought in the 28 SeUS watersheds is relatively insignificant. So much so that the hydrological model uncertainty in estimating the drought index over the 28 SeUS watersheds is larger than the sensitivity exhibited by the drought index to the inclusion of rain from landfalling tropical cyclone. The conclusions of this study are justified by the fact that the timing of the landfalling tropical cyclone in relation to overall soil moisture conditions of the watershed does not coincide with a drought like situation in the 1948–2006 time period analyzed in this study. This largely stems from the fact that the large-scale flow pattern resulting in abundant (lack of) advection of moisture for anomalously wet (dry) summer and fall seasons in the SeUS emanating from the source region of the Caribbean Sea and the northwestern tropical Atlantic Ocean coincides with the steering flow of the Atlantic tropical cyclones bound to make landfall in the SeUS (recurving away from the SeUS). The authors would like to thank Michael Kozar, graduate student of Meteorology in the Department of Earth, Ocean, and Atmospheric Science, Florida State University for generating Figs. 1 and 3. Satish Bastola acknowledges the support of K. Harrison Brown Family Chair and Prof. Rafael L. Bras. This work was supported by grants from NOAA (NA12OAR4310078, NA10OAR4310215, NA10OAR4320143) and USGS G13AC00408.